In this groundbreaking critique of neoliberalism in schooling and education, an international cast of education policy analysts, educational activists and scholars deftly analyze the ideologies underlying the global, national and local neoliberalisation of schooling and education. The thrilling scholarship that makes up Global Neoliberalism and Education and its Consequences exposes the machinations, agenda and impacts of the privatising and 'merchandisation' of education by the World Bank, the General Agreement on Trade in Services (GATS), biased think tanks, global and national corporations and capital, and the full political spectrum of Neoliberal governments. Including such topics as the increasing polarization of racialized and gendered social classes as a consequence of neoliberal policies, the role and shape of markets and education in the era of globalised Capitalism, the effects of the profit motive in higher education, the impact of the Heritage Foundation in the USA, and even a critical evaluation of education in Cuba--readers are sure to find startling insight and provocative arguments throughout Global Neoliberalism and Education and its Consequences. Foreword Nick Grant. 1. 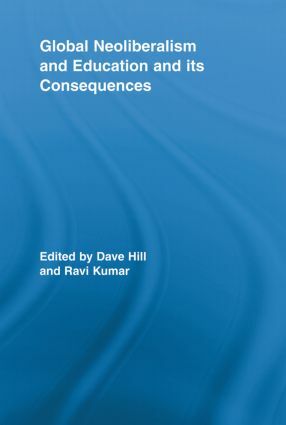 Introduction: Neoliberal Capitalism and Education Ravi Kumar and Dave Hill 2. Neoliberalism and its Impacts Dave Hill 3. Neoliberalism, Youth, and the Leasing of Higher Education Henry Giroux 4. Higher Education and the Profit Incentive Tristan McCowan 5. Trading away Human Rights? The GATS and the Right to Education: A Legal Perspective Pierrik Devidal 6. Education, Inequality and Neoliberal Capitalism: A Classical Marxist Analysis Dave Hill, Nigel Greaves and Alpesh Maisuria 7. Brazilian Education, Dependent Capitalism and the World Bank Roberto Leher 8. World Bank Discourse and Policy on Cultural Diversity and Education in Latin America Carlos O. Mora-Ninci and Eduardo Domenech 9. The News Media and the Conservative Heritage Foundation: Promoting Education Advocacy at the Expense of Authority Eric Haas 10. Markets and Education in the Era of Globalized Capitalism Nico Hirtt 11. Education in Cuba: Socialism and the Encroachment of Capitalism Curry Malott. Contributors. Index. Dave Hill teaches at University College Northampton, UK. For twenty years he was a political and labor union leader. He is Founder Editor of The Journal for Critical Education Policy Studies, www.jceps.com. He co-founded the Hillcole Group of Radical Left Educators with Mike Cole, in 1989. He is Director of the Institute for Education Policy Studies, www.ieps.org.uk. His most recent books, with Mike Cole, Peter McLaren and Glenn Rikowski, are Red Chalk: on Schooling, Capitalism and Politics (Brighton: Institute for Education Policy Studies, 2001) and Marxism Against Postmodernism in Educational Theory (Lexington Books, 2002). His forthcoming books include New Labour and Education: Policy, (In)Equality and Capital (Tufnell Press, 2006) and Charge of The Right Brigade: The Radical Right Restructuring of Schooling and Initial Teacher Education in England and Wales under The Conservative and New Labour Governments 1979-2005. Lampeter, Wales: Edwin Mellen Press (2006). Ravi Kumar teaches sociology at the Department of Sociology, Jamia Millia Islamia University, New Delhi, India. He has experience of working with the students' movement and other grassroots movements in backward regions of India. He worked on "Dynamics of Identity Formation: The Political Economy of Backwards Castes in Bihar" for his doctorate, and has written over a dozen articles on education, communalism and politics. His publications include The Politics of Imperialism and Counterstrategies (co-edited, Delhi: Aakar Books, 2004); The Crisis of Elementary Education in India (edited, Sage, 2006). His specialization is social movements, identity politics, social theory and sociology of knowledge. Neoliberalism is degrading and destroying public education systems globally. The local characteristics may vary, the results are common - increased inequalities in schooling, vocational and higher education, inferior work conditions for teachers and faculty, and detheorized and technicized delivery systems of increasing conservative curricula at all levels of education. Neoliberalism - marketization, privatization, pre-privatization, commodification - is increasingly accompanied by forms of authoritarian conservatism - secular in some countries, religious in others - with increased control, surveillance, and forced abandonment of critique. Such neoliberal and conservative assaults on public education and on broader aims than those which are couched purely in terms of economic/human capital - meet with increased resistance by students, teachers, communities, social movements, and in some countries, political parties. The Routledge Studies in Education, Neoliberalism, and Marxism series features books by new as well as established scholars that throw a harsh spotlight on the conditions under which education currently labors and offers analysis, hope, and resistance in the name of more collective, egalitarian education for social and for economic justice. Please send inquiries and proposals to: Dave Hill (dave.hill@anglia.ac.uk) and Elsbeth Wright (elsbeth.wright@tandf.co.uk).